The Utah sweet pomegranate variety comprises one of the many varieties of pomegranate trees available to backyard growers, according to the California Rare Fruit Growers association. The association notes that this Utah variety has some of the species' sweetest and highest-quality fruit. Like all pomegranate trees, the Utah variety thrives on specific cultural and soil conditions. Provide your tree with the care it needs to grow quickly and produce bountiful amounts of its trademark red fruit. Test the soil around your Utah sweet pomegranate tree with a pH testing kit from any garden store or nursery. Pomegranates thrive best in soil with a pH ranging from 5.5 to 7.0, according to the University of Florida. The pH can be raised with various types of lime and lowered with sulphates and phosphates. Contact your regional cooperative extension system office for further guidance, as amendment amounts vary according to the pH adjustment needed and the type of amendments available in your area. Fertilize the pomegranate tree twice a year in mid-spring and mid-fall (e.g., March and November). The University of Arizona suggests using 2 lbs. of a complete and balanced fertilizer, like an 8-8-8 or 10-10-10 product, spread around the roots of the tree. 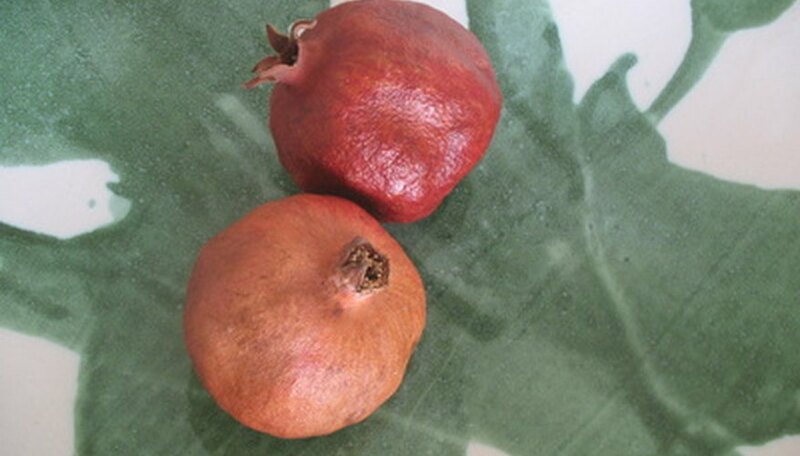 Water the pomegranate tree once a week, according to the University of Florida. Apply enough water to soak the soil to a depth of 24 inches. Though pomegranates are extremely drought tolerant, regular watering helps encourage continuous growth and bountiful fruit production. Prune the pomegranate tree with pruning shears. Purdue University suggests regular pruning during the pomegranate's first three years to encourage thick and full branch development. Make cuts during the early spring, shortening the branches by up to 30 percent each year. Always trim the branch on the outer point located past a leaf node, which is the bump on the pomegranate's branch where new leaves grow.